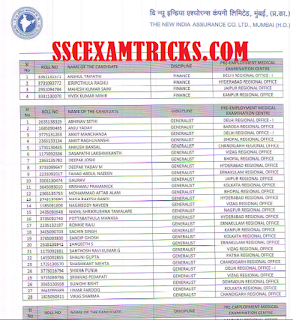 NIACL AO 2nd Selection List 2015 Declared - Download NIACL Administrative Officers Pre-Employment Medical Examination List 2015 - Check NIACL AO 2nd List Final Result 2015: NIACL has declared 2nd Selection List of the candidates on 20th August 2015 on the official website www.newindia.co.in. 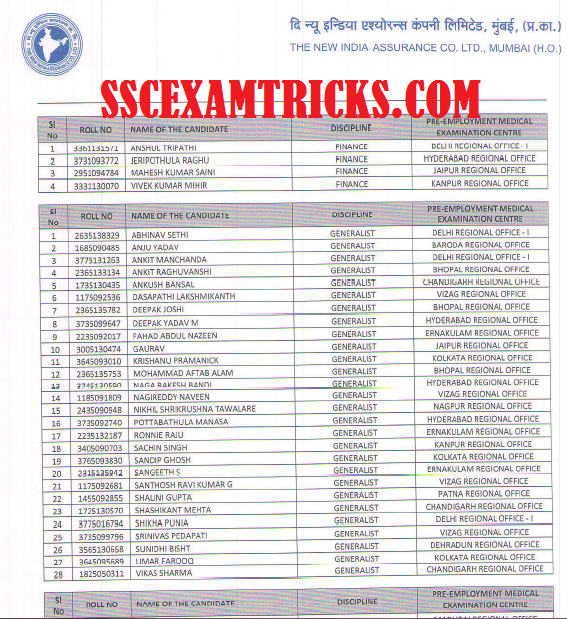 The List of pre-employment medical examination contains the name, roll number, discipline, exam centres for medical examination of the candidates. A total of 32 candidates have called at the respective regional offices for medical test. The Appointment offer letter and joining will be given after the medical examination of the candidates. The medical examination will be held from 21st August 2015 to 28th August 2015 (excluding all weekends & public holidays). The date, time and medical examination venue is mailed to the candidates on their respective email ID. Those candidates who are waiting for NIACL 2nd Selection List for AO posts, they can download selection list from direct link given below. The candidates can attend medical examination with one photo ID such as PAN card, driving license, Aadhar card, Voter card ID and passport etc.). The Appointment will be given with checking of original documents at the time of joining. 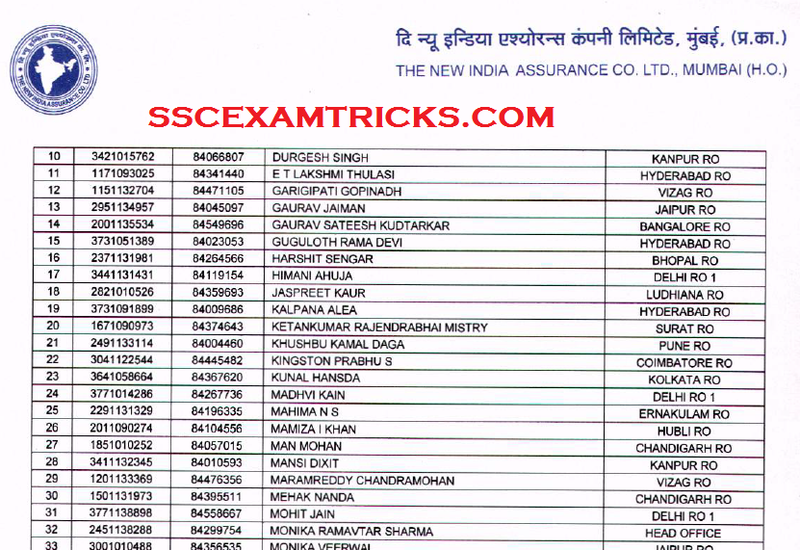 The New India Assurance Company Limited has released final result on 20th March 2015 on official website in which a total of 509 candidates are finally selected for the posts of Administrative officer Scale-I based on the performance in written examination which was conducted on 10th & 11th January 2015 at various centres in all over the country and personal interview which was schedule on the various dates (Alphabetic order of Candidates Name) from 3rd Week of February 2015 to the last week of March 2015. These candidates are called for Medical Examination which is schedule from 23rd March 2015 to 01st April 2015 (Including Saturday, Sunday & Public Holiday) in Moring at 11:00 AM to 1:00 PM and Evening Session at 2.30 PM to 4.30 PM. The list of provisionally selected candidates is released along with venue of reporting for medical examination of their region. These provisionally selected candidates are required to bring at least one photo identity to the venue of medical examination. The Email/ SMS has sent to these provisionally candidates about the medical examination date, time & venue of Medical Examination. In case any candidate does not receive email / SMS they are advised to report for Medical Examination at the declared venue along with their interview call letter. NIACL has also sent format of Service Agreement to these provisionally selected candidates which will be required to be submitted at the time of getting appointment / Joining on these posts. NIACL had invited Applications for NIACL AO EXAM 2015 provided on the official website and successfully completed the process of filling ONLINE applications for the posts of Administrative Officers (AO) Scale I. Those candidates who had appeared in the interview and waiting for final result, they can download their final result from the direct link provided in the end of the posts. · Schedule of Medical Examination – From 23rd March 2015 to 01st April 2015 (Including Saturday, Sunday & Public Holiday) in Moring at 11:00 AM to 1:00 PM and Evening Session at 2.30 PM to 4.30 PM. The Final Selection of the candidates will be done based on the performance in written examination and personal interview along with document verification and medical examination of the candidate. The exam consisted of various sections English (50 questions of 50 marks), Reasoning (50 questions of 50 marks), Quantitative Aptitude (50 questions of 50 marks), General Awareness (50 questions of 50 marks). The exam was a multiple choice question paper of 200 questions of 200 marks and five options were provided out of which candidates need to choose one correct answer. The time duration was of 2 hours or 120 minutes. The exam consisted of various sections English (40 questions of 40 marks), Reasoning (40 questions of 40 marks), Quantitative Aptitude (40 questions of 40 marks), General Awareness (40 questions of 40 marks) and Technical & Professional Knowledge (40 questions of 40 marks). The exam was a multiple choice question paper of 200 questions of 200 marks and five options were provided out of which candidates need to choose one correct answer. The time duration was of 2 hours or 120 minutes. The qualified or short listed candidates were called for interview round which was scheduled on the various dates in the month of February 2015 & March 2015. The personal interview was conducted along with document verification of the candidates. The Final weightage (ratio) of online Examination and interview was 80:20 respectively. The combined final score of candidates was calculated at on the basis of scores obtained by the candidates in the online examination and interview. The interview result has announced on 20th March 2015. A total of 509 candidates are called for medical examination which is scheduled from 23rd March 2015 to 01st April 2015 in morning and evening sessions. Candidates are required to bring interview call letter along with one photo identity proof such as Voter Card ID/ PAN card ID/ Driving License etc. at the venue of medical examination (region wise). · Address proof i.e. Ration Card, Aadhar Card, PAN Card, Voter card or Driving License.